It's been said that "shoulders make the man." Update that to include "or woman" and you've got yourself an idea to get behind. To that end, here's a 10-week program that'll blow up your delts and blow your mind! If there's one muscle group that screams power, it's the shoulders. You can't hide them in a T-shirt, hoodie, or even a jacket. Who'd want to? Shoulders were once a primal symbol of masculinity and virility reserved for men. Now, they're on everyone's wish list, because the bigger and wider your shoulders are, the smaller your waist seems. And who wouldn't want that? The best way to improve a specific muscle group is to give it priority in your training for a limited period. 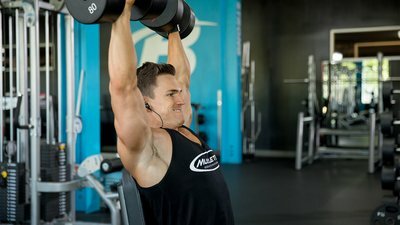 In this workout—as in other "blueprint" workouts I've created—I've set 10 weeks as the amount of time you'll need to see some noticeable gains in your shoulders. During these 10 weeks, you'll work shoulders twice a week and every other muscle group once. By devoting more time and energy to your shoulders than you normally would, you force them to adapt by growing larger and stronger. But you can force them for only so long. Continue this approach too long and you'll over-train the muscles and cease to see results—which is why we limited the length of this plan. This weekly schedule is designed to give you your best chances at making the fastest shoulder gains possible in 10 weeks. As with previous specialization routines I've created, the two weekly workouts included in this plan are quite different from each other. The first is heavier, with reps in the 8-12 range, and more free weights. The second takes the reps higher, uses more machines, and employs more intensity techniques such as dropsets and supersets. You'll have a full day of rest preceding the heavy day, and it's followed by a leg workout, so your shoulders will have time to recover. The second workout of the week is far more demanding in terms of both execution and recovery, so it's sandwiched between two full rest days. Here are the two shoulder workouts for each week. Notice that each day starts with a warm-up to get your body—and your mind—ready for what's to come. For each set, perform 8 reps while seated, then immediately stand and do 8 more. Add weight as you work through the sets. For each set, perform 8 reps to failure, reduce weight, and do 8 more. You may have noticed that there's no direct anterior-deltoid work included in this program. The front delts get worked hard on any type of pressing movement for the chest, including overhead shoulder presses, so they don't need any specific exercises. In fact, the most common type of imbalanced shoulder development is when someone has heavily developed front delts, mediocre side delts, and practically nonexistent rear delts. I have yet to see anyone who regularly weight trains and has weak front delts, unless they have weak shoulders in general. Rest assured that I have included more than enough pressing movements in this program to take care of your front delts. Put your energy and effort into the other two delt heads to get those big boulder shoulders you're after. I didn't include specific exercises in this workout for strengthening your rotator cuffs, either, but I strongly urge you to work them twice a week. External rotation and cable internal rotation exercises are just a couple moves that can help you keep them strong. These exercises can be tedious and lack the thrill of lifting heavy and getting a sick pump, but they take only a few minutes and are a valuable insurance policy against an injury that could sideline you for months. Just try doing back squats with a torn rotator cuff, and you'll see just how important this part of your shoulder is. Keeping the cuff muscle complex strong and injury-free will improve your shoulders, along with almost every part of your upper body. 3. Don't Skip The Rear Delts! You may feel tempted to add front-delt work into this program—and maybe bypass your rear delts altogether. Who cares about rear delts, right? It's those side delts that give you that roundness and width! Well, that might be true if you were a two-dimensional paper cutout, but we exist in 3-D. If you want impressive shoulders that are round and full from every angle, you need to work all three heads of the deltoid muscles. Lagging posterior delts are a glaring weakness whenever you are standing sideways, and will take away from the overall impact of your shoulders. Work them just as they are outlined in the routines, and work them hard! Some movements are meant for heavy weights, for pushing or pulling a load from point A to point B. In the realm of deltoid exercises, overhead presses fit that description. You're not trying to isolate anything. If your form is decent, you're good to go. Presses are tough to screw up. Lateral raises, on the other hand, are not power movements and not suited to heavy weights. Think of them more as finesse movements, designed to isolate a particular aspect of a muscle. But lateral raises are pointless if you use momentum and other supporting muscles to raise the weights. If you do those kinds of cheats, you won't be able to feel your medial deltoids firing and contracting, which is where the growth comes from. Instead of cheating the weights up, lift them explosively, hold them for a split-second pause at the top, and control them as you slowly lower them down. You can't practice this ideal form if you're trying to lift too much, so go light and pay close attention to your movement pattern. And don't worry, no one is ever going to ask you how much you use on lateral raises. Do laterals right, though, and people will ask, "Wow, what do you do for your shoulders?"